Man, this is a big building. Commodious, if you will. 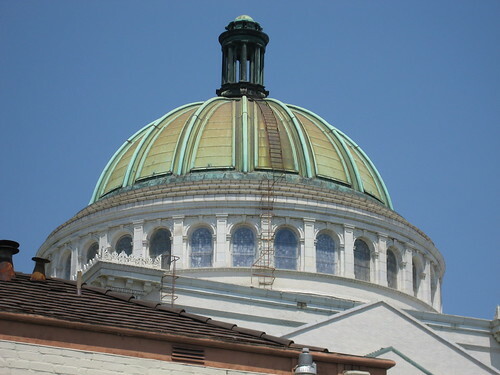 No wonder the church, what with its giant copper dome and all, stands as a neighborhood landmark in the broadest of terms. 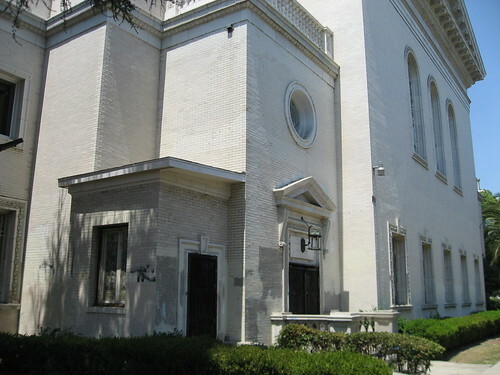 The church was designed in the Beaux Arts/Italian-Renaissance style by Alfred F. Rosenheim, also responsible for other Los Angeles landmarks, including the nearby Britt Residence (No. 197), Hamburger’s Department Store (No. 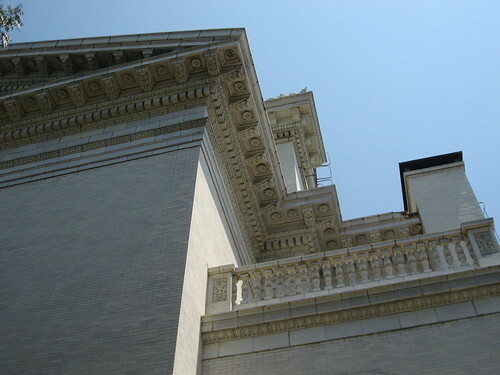 459), Clune’s Broadway Theatre Building (No. 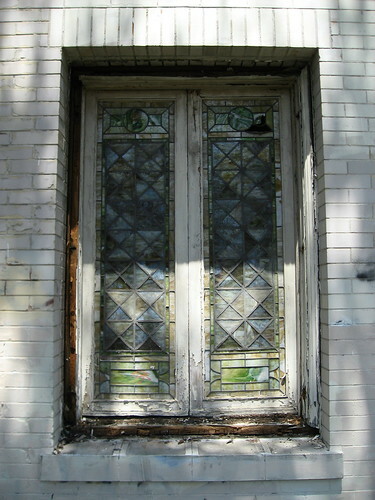 524), and the Hellman Building (No. 729). 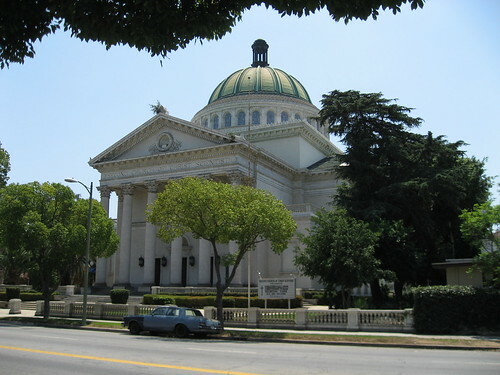 Gebhard and Winter say the Second Church of Christ Scientist of Los Angeles was influenced by Boston’s Mother Church. Albert C. Martin was the engineer of the Second Church. The SCoCoLA cost more than $300,000 and took two and a half years to build. 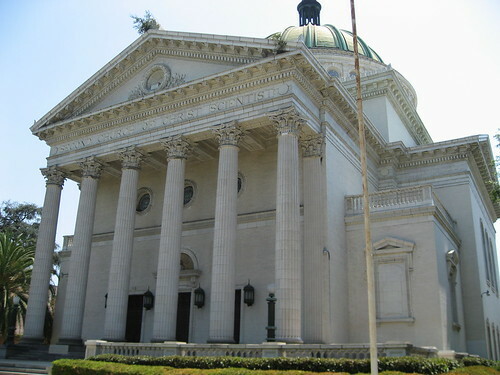 It opened for holy business on January 23, 1910. 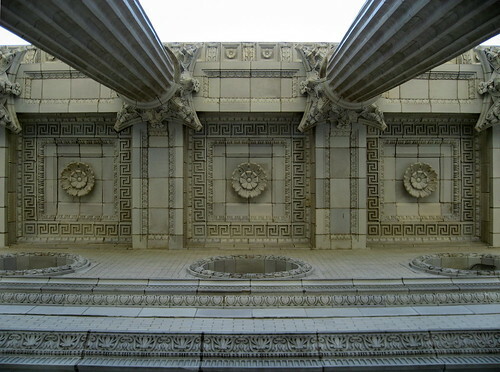 This is the view when you look up as you enter the church. Designed when things like this mattered. 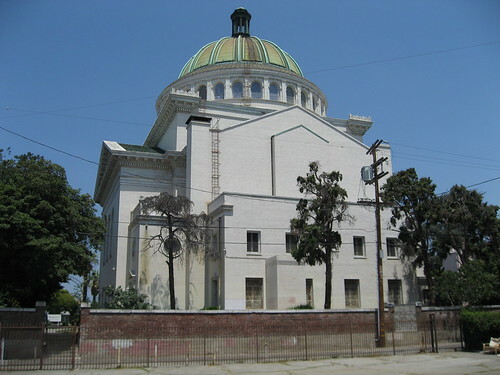 A June 28th, 1908, Los Angeles Times article categorized the architecture as “pure Roman Corinthian… built with white glazed brick and terra cotta trimmings”. At the time, it was “the largest and most elaborate church west of Chicago.” It was designed to accommodate 1200 worshippers. A Sunday School room seats 700. As far as the interior goes, a 1910 L.A. Times article reports “the wainscoting, doors, pews and all other interior woodwork is in selected mahogany, stained a soft brown tone, and the floor is covered with interlocking rubber tile of harmoniously contrasting colors.” That same article heralded the church as the “Most Beautiful and Costly in the West.” The church also boasted a $14,000 pipe organ upon opening. 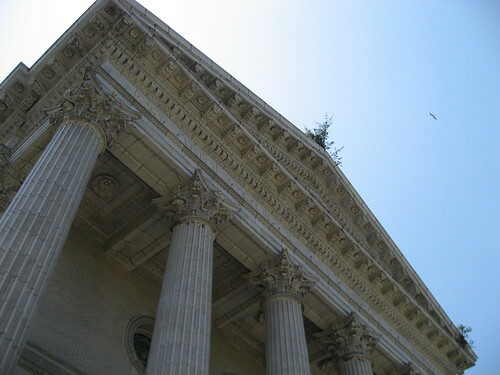 The Corinthian columns reach forty feet in height. The dome is 130-foot tall, seventy feet in diameter, and weighs 1400 tons. 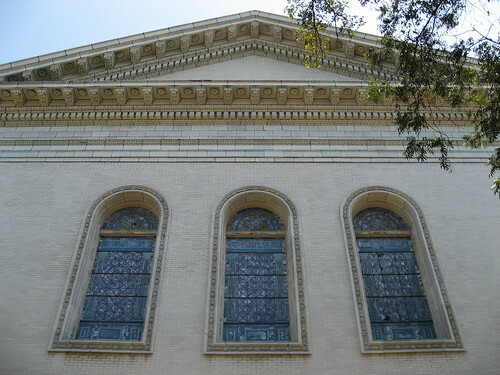 You can tell by these fuzzy pictures that the church is still in good shape, but could use a little help, especially around the leaded windows, also designed by Rosenheim. As you can see, not much has changed except the trees and the car(s). Oh, and the median, too. 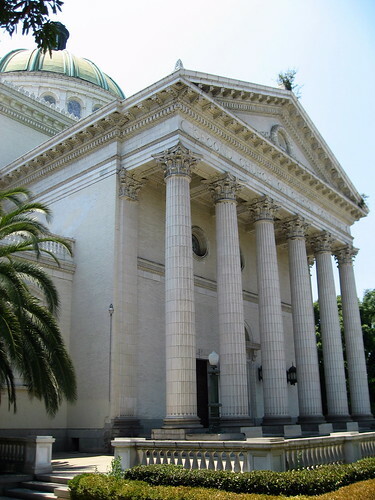 Still known as The Second Church of Christ Scientist of Los Angeles with Sunday services, the L.A. landmark is also listed on the National Register of Historic Places. 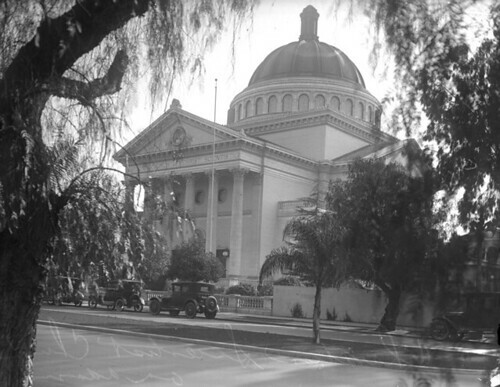 “Magnificent Scientist Church Assuming Shape.” Los Angeles Times; June 28, 1908, p. V1. “Marvelous Work in Reinforced Concrete Found in Local Church” Los Angeles Times; September 13, 1908, p. V1. “Fine Temple of Scientists.” Los Angeles Times; January 22, 1910, p. II6. The latest chapter on this landmark is the FOR SALE sign which now hangs on the chain link fence which surrounds the church. Word has it that the congregation is so small that the large scale of the church is not needed and is impossible for them to take proper care of. This Church is also incredible on the inside. 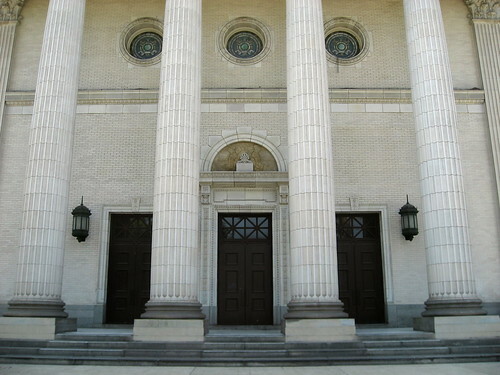 The sanctuary is on the second floor. As you enter the up the main stairs you walk into the space under the dome, with the space around you opening as you ascend (yes that is the correct word) up into the sanctuary, a very impressive entrance and very spirtually uplifting esp with the stain glass on on the wall and under the dome. Thanks, LAGianniK. I wasn't inside, but it's gotta be huge, so I can believe it. But is there a congregation out there that needs a new home of this size? Stay tuned. A wonderful organization dedicated to human values, service, meditation, breathing, stretching, silence and love is planning to revive this magnificent property very soon. the church is been bought by the Art of Living foundation, which uplifts human values in the society. I think this foundation is doing an amazing job. Even there programs are so innovative.